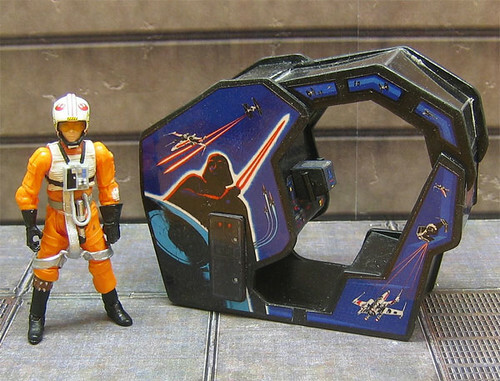 That'd look real nice in my paper arcade. They are still sealed, which is great! Also bought some stormtroopers too! The force be with you, always. Charity shops are great for random star wars finds though. A long time ago (in a galaxy far, far away...) I bought a pop up star wars book (that i've never seen anywhere, including ebay); then a few years ago I got a, what I think was, original T-shirt. Faded to hell, but something like 50p. Got torn to shreds at a gig and I cried. The Star Wars Vault book is also superb, simply because of the Star Wars Sick bag within. Isn't he a little short for an X-Wing pilot? Just came through in the post yesterday. SpiffierRabbit wrote: I LOVE STAR WARS!! had no idea they did star wars micro machines ...the do look pretty cool ma good work. That vault books got some fantastic stuff in it, as has the Vader one and the pop up one, I've got a decent figure collection, albeit it's not my original collection but I've not really got any vehicles, I've got a speeder bike and some mini-rigs but for some reason I was never interested in picking any vehicles up back in the day. The current figure collections seem a bit poor compared with the original stuff though. Star Wars was great up until 1983. Return of the Jedi was a woeful sequel and was everything a typical naff sequel usually is - i.e. back to Tatooine, another Death Star etc. and don't even get me started on those bl***y Ewoks! The Empire Strikes Back was the nadir of Star Wars movies. Whilst there were a few good isolated moments in each of the SW prequels, they were 95% crap. TESB was good because (a) GL wasn't the only writer to work on the screenplay, (b) they hired a great director! dont think you mean nadir then? As much as I love Star Wars and ESB, Return of the Jedi was the first one I saw in a cinema so it has a special place in my heart. And my Dad fell asleep during the final battle. How he could sleep with all that racket I'll never know, but he did AND he snored. I've always thought Jedi was the best of the 3, especially with the death star battle at the end followed by Star Wars and then Empire. Who is your Star Wars Character??? I might say Jango Fett or the Emperor. pure evil! When I was a kid I got bought a poster that said "Revenge of the Jedi". That confused me for a while.